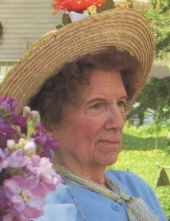 Marjorie Lillian Strobel, age 94, of Plymouth, passed away peacefully on Wednesday evening, March 27, 2019, at Sharon S. Richardson Community Hospice with her family by her side. She was born in Milwaukee, WI, on June 9, 1924, a daughter of the late Peter and Anna (Theis) Becker. Marge attended St. Boniface Catholic Grade School in Milwaukee. She attended Messmer High School for one year before attending and graduating from North Division High School in Milwaukee. While visiting her sister Dolores, in Plymouth, whose husband Leonard owned a funeral home, Marge met Charles Strobel, who worked with Leonard. Her visits became more frequent and they knew they were falling in love. When World War II broke out, Chuck enlisted in the Navy. While he was serving overseas, Marge worked at Cutler-Hammer Company in Milwaukee as a Photostatic Reproductionist in the Blueprint Department working on Navy plans. After Chuck's return from the war, the couple were married on June 8, 1946, at St. Boniface Catholic Church in Milwaukee. They began their married life together in Plymouth where Chuck continued his work with Leonard in the funeral business and the start up of the Plymouth Cheese Counter. Marge worked there as a (pregnant!) roller skating carhop, serving custard. With a growing family, and another funeral business opportunity, Marge and Chuck moved to Janesville, WI. A year later, they returned to Plymouth when Leonard asked for Chuck's help with both the funeral home and the start up of a new cheese business, which would become Sargento. While Chuck's work led him to eventually being named President of Sargento, Marge also contributed to the business volunteering her artistic abilities. With her children at the table doing homework, she created packaging designs and promotional materials, including the original Sargento logo. Marge wanted a large family and being a loving mom to her nine children gave her the most fulfillment. Though times were tight and her family was growing, she relied on her creative ingenuity to provide the most for her family with limited resources. Nothing was too difficult if it meant providing memorable times, including climbing a hill with her nine children, a canvas tent, crib and camping supplies, all so that the family could enjoy the view while there. Marge was an artist and a writer. One of the ways she shared her gift for storytelling was through writing the family history in the most creative and amusing way. Her handwritten letters were also filled with humorous stories accompanied by even funnier sketches and were typically never less than 7 pages long! Never content with keeping life simple, she never met a room she didn't want to rearrange. She sang beautifully, often while making dinner or while putting her children to sleep. She had learned to play piano by ear and shared her love for music with her children and grandchildren. She enjoyed crossword and jigsaw puzzles, and a good game of Scrabble enhanced by her inventive sense of humor was one of her favorites. On her own time she enjoyed reading historical memoirs and family sagas. She was a member of St. John the Baptist Catholic Church in Plymouth. She also was a member of the Plymouth Fun Club. Survivors include: 9 Children: Bonnie Strobel of Manitowoc, Barbara (Michael) Dellger of Sheboygan, Phil (Diane) Strobel of Cedarburg, Vicki (Steve Schwartz) Strobel of Kalama, WA, Rich (Penny) Strobel of Cedarburg, Jeff (Pat Zingsheim) Strobel of Spring Green, WI, Lori (Dan) Jarosh of Plymouth, Susan (Bill) Angoli of Maribel, WI, and Dave Strobel of Plymouth; 21 Grandchildren; 7 Great-grandchildren; and Sister-in-law: Rita Zolp. Marge was preceded in death by: Her Parents; Husband: Chuck; Siblings: Jerry (Doris) Becker, Dolores (Leonard) Gentine, El (Marian) Becker, Ray (Adeline) Becker, and infant siblings: Rosella, Marcella, and Francis; and Brothers and Sisters-in-law: Virginia (June) Tupper, Paul (Angie) Strobel, Ethel (Ralph) Payne, Harry Strobel, Evie (Kenny) Eigenberger, and Ben Zolp. A Mass of Christian Burial will be held on Tuesday, April 2, 2019, at 12 Noon at St. John the Baptist Catholic Church in Plymouth. Father Dennis Van Beek will officiate. Burial will be in the Parish Cemetery. Visitation will take place on Monday evening, April 1, from 4:00 – 7:00 P.M. at the Suchon Funeral Home in Plymouth, and at CHURCH on Tuesday morning, April 2, from 11:00 A.M. until the time of Mass. The family would like to thank the staff at Pine Haven where she had been a resident for the past 2 years, and also to the staff of Sharon S. Richardson Community Hospice for the wonderful care and compassion given to Marge. To send flowers or a remembrance gift to the family of Marjorie L. Strobel, please visit our Tribute Store. "Email Address" would like to share the life celebration of Marjorie L. Strobel. Click on the "link" to go to share a favorite memory or leave a condolence message for the family.